Drill position can be adjusted up to 10 mm travel on each axis straight front to back and pivot side to side. After engaging the magnet, the drill position can be adjusted up to 10mm travel on each axis straight front to back and pivot side to side. 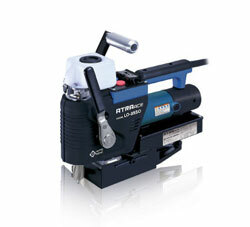 Fast revolution of Jetbroach cutter makes less cutting resistance and smooth handling.